We had a very relaxing day on Saturday. Not much to report. We took the train from Rome to Arezzo in the morning and got in around 1:30. Drove to Anghiari and sorted our dirty clothes and dropped them off at the lavanderia on our way to get gelato. We became so enchanted with the gelato at our place in Rome that we’ve become a little snobby about the gelato here. It’s good, but not quite up to the same standards. We strolled around town a little, saw a couple of old friends, did a little shopping, and had our happy hour on the piazza. Very lazy Saturday – we needed that after our hectic Rome trip. We packed a lot in in Rome and went pretty hard everyday. It’s nice to relax some after that. Our train was not crowded so we got to spread out and stretch our legs. We did have some fellow Americans (sounded like they were from New York) in our car. That was funny and a little unpleasant. 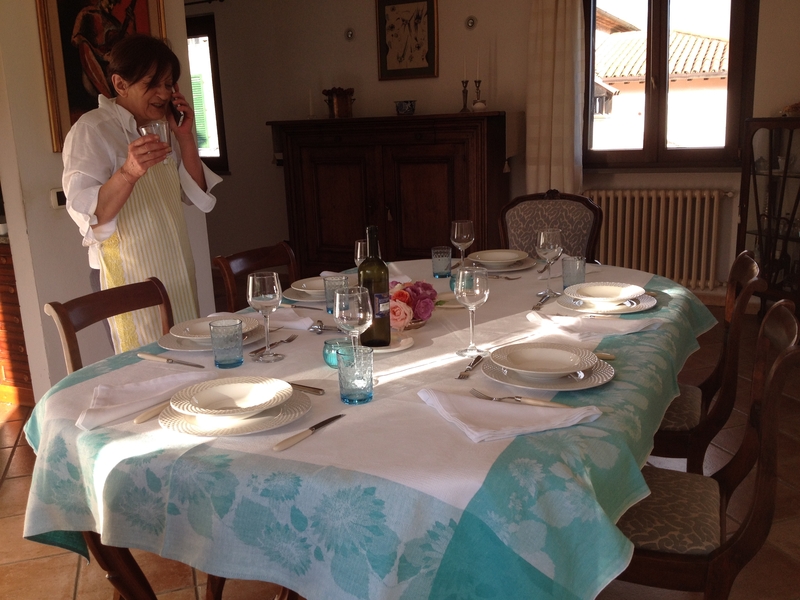 We had dinner with Michelangelo and Rossella and her cousin Carlo that evening. 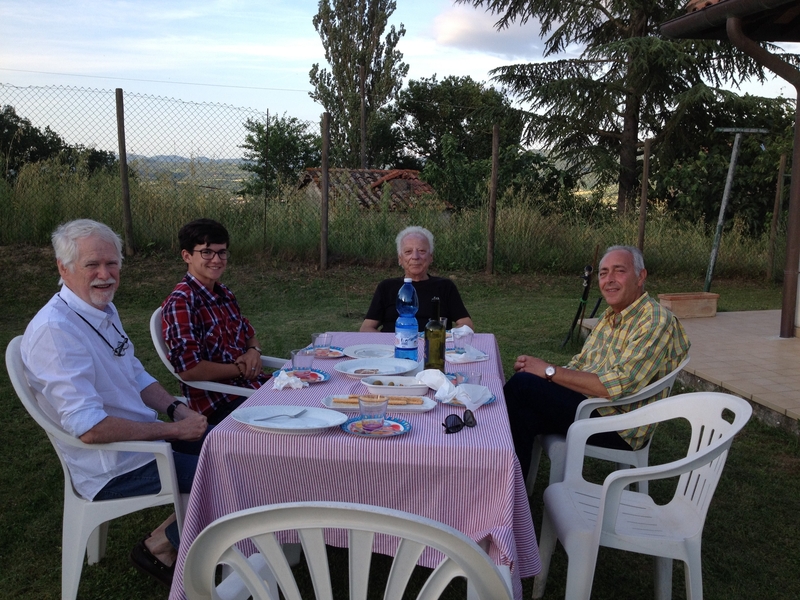 We had aperitivos and appetizers out in the garden. Very nice. It was quite breezy and things kept blowing away. They had a big thunderstorm here on Friday night and a nice crisp wind came through after. Michelangelo and Rossella live up on a mountain, so it’s generally cooler and breezier up there. Even in Anghiari it was nice and breezy – very pleasant. We have really lucked out on the weather. It’s been very nice – some hot days, but nothing like we’ve experienced in the past and always at least a gentle breeze. For dinner we had pasta with pesto (Hunter tried it, but wasn’t a fan), roasted pork, roasted potatoes and fagatto (liver). Italians eat every part of the animal and organ meats are very popular. I must admit I’m not that much of a fan of it, although I did try it. Then a wonderful assortment of desserts – profiteroles, a couple of other pastries, and a crostata with blackberries. And prosecco to go with it all. Very nice. Sunday we go to Ravenna to see the incredible mosaics. Then Monday we go back to Florence to prepare for our trip home. In some ways it seems as if we just got here. 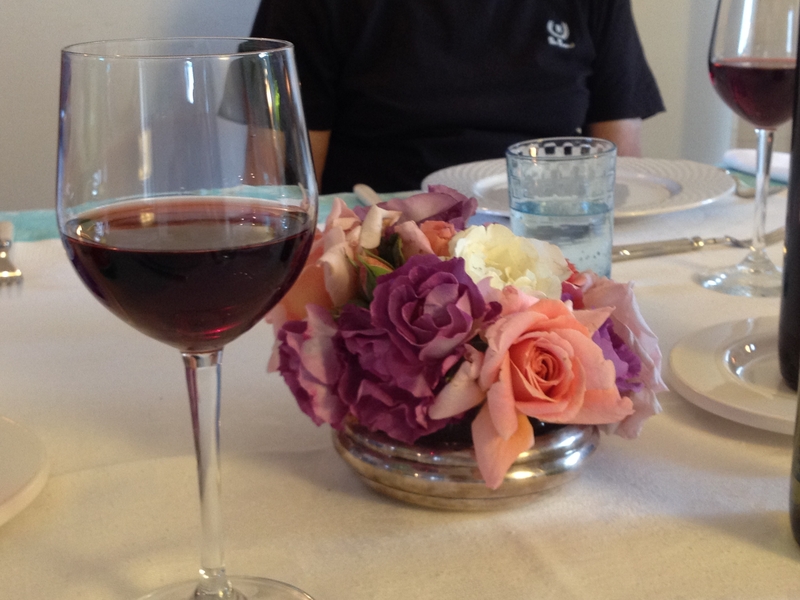 We’ve become comfortable in our little Italian apartment and enjoyed our excursion to Rome. Here’s hoping the last couple of days live up to the rest of the trip.